I haven't felt so consistently distracted for so long. I will try getting a little more sleep and see if that helps. Working out is going well. We are sticking to it. I'm squatting 70 lbs which isn't a lot in relation to what I used to do, but good considering I could still have a hard time walking. Had a death in the family and things feel off balance at home, but not terrible. Hysteria abounds. First the colored terror alerts, then child abduction, and breaking and entering turned into home invasion, etc. It is sad that we haven't figured out a better safer society. My kids have a friend who is basically homeless. Her mom and brother are sleeping in their car outside a day labor place. She is staying with us a few days. They used to hang out at Alvarado park in the evenings as their relaxation and often stayed in motels. My compadre is laid off as a trucker. My brother in law seems worried that his job may shut down. There are lots of people worried about their jobs these days. And yet there are bailouts for the rich. Well, I'll try to work out this afternoon and blow off steam. I started playing music for money again and will be making some extra bucks. Well, I got to workout on Sunday. I got a little sore too. Not bad. I don't think I'll make it tonight, but maybe tomorrow or Thursday. It is helping me to keep going. "Solidarity is the consciousness of the common interest, and the actions that follow from this consciousness." "Ignorance of humanity's common interest, that is, ignorance of solidarity, makes each man see in the otehr man a competitor who must be vanquished so that he can live." "One must consider an injury to one an injury to all." Well damn... I start back with rehearsing today. And last night I was voted in as Vice-President of the District 6 Coalition of Neighborhoods. We were also on TV because we want to stop additional liquor sales in the neighborhood. Here is some news coverage. Well my daughter has graduated! My son is working part time and enjoying it. What was amazing to me is the amount of control games schools play - even up through graduation. There were rules, you had to have tickets to an event that wasn't full, you couldn't bring in balloons or banners, etc. It was all very rude, but after 13 years as an Albuquerque Public Schools parent I have come to expect being patronized on a variety of levels. Maybe I should have run for school board after all! Anyway, at least that is done. Now it is time to find money for college!!! We've been looking, but not much has panned out yet. Long week. My low oppressive workplace finally became normal. Yay! Just another job. A very close friend closed an email account. Kind of a bummer. And yesterday I took my 'jita to school for the last time. She graduates on Monday!!! I'm very proud of the kids, and of my wife for all of the support she's been able to provide. And I'm really appreciative of all the friends who have supported me in one way or another for such a long time. At some point I'll run into something that is on time and I'll be the one late! Consider voting yes on the idea that more taxes for more services is a good investment. If you are not sure please read.... http://www.msnbc. msn.com/id/ 30363790 before voting. If you vote yes, please encourage others to vote yes also! I went to a celebration of the Anti-Profiling Bill which was passed and signed during the legislature. It was a nice celebration. It was nice that they mentioned La Raza Unida as well as all the organizations formally part of this coalition. They also celebrated the passing and signing of the Repeal the Death Penalty bill. "The true leader uses all his power, not to rule others, but to impart the power and intelligence to them to rule themselves." Got to work out yesterday! It is nice working out more regularly. Walking afterwards was good too but a little tough. Lots of stress at work, but I'll figure it out. My 'jita graduates next week! My son has a job! How cool is that!!! 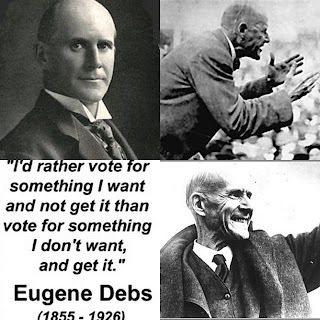 "It is better to vote for what you want and not get it than to vote for what you don't want and get it."